Turnovers spoiled the San Diego Strike Force’s first game at Pechanga Arena San Diego on Sunday as quarterback Derrick Bernard had two passes intercepted and lost a fumble that was returned for a touchdown in a 65-44 loss to the Tucson Sugar Skulls. Bernard was sacked and fumbled on the Strike Force’s second possession in the Indoor Football League game, with Keith Jones Jr. recovering the fumble and running 2 yards for a touchdown. Tucson converted Dee Maggitt Jr.’s 34-yard return of an interception of a Bernard pass 48 seconds before halftime into a 15-yard touchdown run by quarterback Matt Behrendt, increasing its lead to 35-17. The Strike Force cut the deficit to 35-24 on Bernard’s 1-yard touchdown pass to Julian Stafford as time expired in the first half. The Strike Force twice pulled within five points in the second half, 35-30 and 42-37, but could get no closer, dropping to 0-2. Bernard completed 19 of 40 passes for 179 yards and three touchdowns before a crowd announced 3,248. Behrendt completed four of six passes for 67 yards and one touchdown in the inaugural game for the Sugar Skulls. Jake Medlock, who entered the game on Tucson’s first possession of the second half, completed 10 of 14 passes for 142 yards and four touchdowns. The Strike Force trailed 299-184 yards in total offense and 19-16 in first downs but led 33:23-26:37 in time of possession. George Moreira Jr. ran for a 5-yard touchdown in the second quarter and a 4-yard touchdown in the third for the Strike Force, who also got a 48- yard fumble return touchdown from Sean Potts-Harris to open the scoring in the second half. The Strike Force led just once, 3-0, on Ernesto Lacayo’s 23-yard field goal on the game’s opening possession. Those were the only points the Strike Force scored in the first quarter. Running back Mike Jones ran 4 yards for the first of his two touchdowns on the Sugar Skulls second possession, beginning a run of touchdowns on four consecutive possessions for the Tucson offense. He also ran 3 yards for a second-quarter touchdown. The Sugar Skulls added a safety with 49 seconds to play when Keith Jones sacked Bernard in the end zone. Indoor Football League rules are similar to the better-known Arena Football League with two teams of eight players each playing on a field 50 yards long by 28 yards wide with 8-yard end zones bordered by side walls and end walls used as boards for hockey games. Punting is not allowed, forcing teams on fourth down to either try for a first down or attempt a field goal. A key difference is that there are no rebound nets behind the end zones in the IFL because that is part of the AFL’s patented game system. 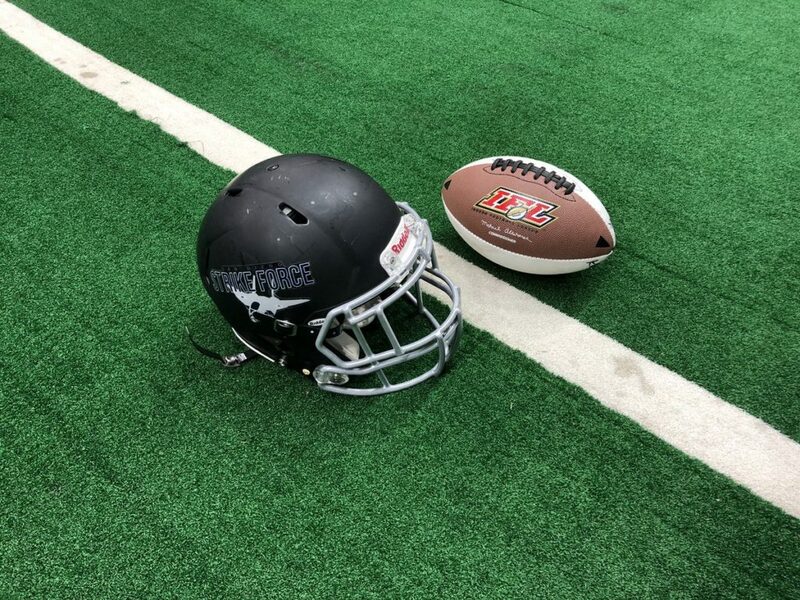 The kicking team in the IFL receives one point for a kickoff not returned out of the end zone. The Strike Force will next play Saturday at Cedar Rapids.